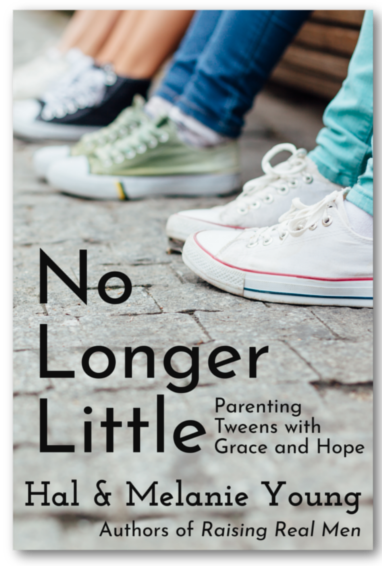 This review is a bit of a change in pace for me, I received an electronic copy of No Longer Little: Parenting Tweens with Grace and Hope from Great Waters Press for myself to read and review. I’m so used to working with EJ on curriculum reviews it was nice to have this one for myself. And while I lived through the preteen and teen years (and survived) with his mother and her sisters, I’m not sure I was ready for this child who seems to be suffering from pre-manhood syndrome (Hal and Melanie’s name for the maladies of a young man going through the hormonal changes of puberty). As I continued to read this volume I felt as though Hal and Melanie were speaking directly to me. They really understand what we’re going through (with six boys of their own they’ve pretty much seen all the variables by this time). As parents themselves, they instilled a high level of trust in me regarding their methods and advice. A good feeling for sure. Of course, they speak about girls going through puberty as well and I promise you they do a terrific job of it. I wish I had this book years ago instead of having to figure things out for myself when the girls were younger. Where has our little boy gone? you just know Hal and Melanie are going to deliver their message with a mix of seriousness and humor, just what the frazzled and addled parent needs. One of my favorite lines in the book is when they compared their sons as they went through rushes of hormones to porcupines…flaming porcupines. If there had been any doubt I knew at that moment this was the book for me! Could this sweet little boy proudly receiving his First Holy Communion really turn into a fractious, angry pre-teen? And as Hal and Melanie warn, could he begin to question his faith? As children move into puberty and develop toward adulthood, they will question things in a different way. No longer will the answer, “because mommy and daddy do,” suffice. They want – and need – to understand. As they advise through this well-written book, Don’t freak out! There needs to be an adult in this relationship and that is you. Hal and Melanie give some wonderful advice on how to face each of the crisis that we as parents (and grandparents) face as the youngsters in our family enter and go through puberty. Written from a Christian viewpoint, there are references to scripture that the authors have used with their own family to help get them through the tough spots. Remember, your child may feel as though they are riding a rollercoaster of emotions and they need you there to help them understand it all (even while they might seem to be pushing you away). Yes, these boys of our are going through some immense changes, both internal and external. I could totally relate to Melanie’s comment about her boys growing out of their church clothes. It seemed to happen to EJ overnight! It felt like we were just discussing how we needed to hem his suit jacket sleeves or take in the waist of his dress pants and there he stood, almost as tall as his mom and grown out of his good church suit. Hal and Melanie do a terrific job of taking the reader through these changes and how they can affect every aspect of the child’s life, including their schoolwork. They talk about children who loved math and science and are now frustrated and discouraged, feeling as though they aren’t good at anything. Again, they admonish us to not freak out and provide some great advice on what might be causing the troubles and how to get past them. During this time of great change, we grown-ups are also trying to lead these quickly growing human beings into having a good work ethic and to become good members of society. We also want to be sure they have the life skills they need to move forward in their lives. We always had our girls do household chores up to their abilities and I can remember being shocked when one of my Girl Guides (she was about 12 or 13) couldn’t flip a pancake. This seemed such a simple task to me and our girls all knew how to cook basics like pancakes and grilled cheese sandwiches with supervision of course). The Youngs also speak of how important it is for both boys and girls to have the skills they need to survive in life. Again, I was reading the words of someone who has the same type of values that I do. It felt like I was corresponding with friends. I find I can’t say enough good about No Longer Little: Parenting Tweens with Grace and Hope from Great Waters Press. I have shared parts of the book with my daughters and husband and they also like what Hal and Melanie have to say. This book is a definite fit for our family and I would recommend it to other families with children entering the pre-teen years. Some of our crew families also reviewed Love, Honor, and Virtue: Gaining or Regaining a Biblical Attitude Toward Sexuality. This book is written for boys aged 12 to in their 20’s. Both of these reviews can be found by clicking the image below. Kimberley, I loved reading your review and hearing about what was going on in your life with your grandson! It meant so much to me! We’re linking to it from No Longer Little’s review page here: https://nolongerlittle.com/reviews . Thank you for reviewing our book! !